Ruptly Stringer app - live broadcast. Berlin, February 2016: By downloading a single app onto their phone, anyone of legal age can become a paid contributor in seconds, thanks to Ruptly Stringer, a unique citizen journalism app. Launched by RT’s video news agency, Ruptly, the app puts freelance journalists and eyewitnesses in direct contact with the newsroom. “The most popular videos are usually the ones shot by eyewitnesses on their mobile phones, and this user-generated content [UGC] is always of great interest to news agencies, TV channels, and other media platforms,” said Ruptly head Xenia Fedorova. “Ruptly Stringer not only allows us to exclusively access this content, but also helps news editors verify the authenticity of the footage received." Many leading TV media outlets allow their audience to randomly upload self-shot footage, often for free, on the off-chance it will be broadcast. But, Ruptly Stringer is much more than that – it turns citizen journalists into a part of Ruptly’s news-gathering operation. If citizen journalists see a story happening in front of their eyes, they can offer the footage to Ruptly at the click of a button. It will be assessed by video editors immediately, who will offer a sum for the content, and if the journalist accepts it, will pay immediately, through a connected PayPal account. The video will also be verified: a sophisticated matching system will help ensure it is original, while geolocation will be used to confirm the reporter really is at the heart of the action. But this is not the end of it. 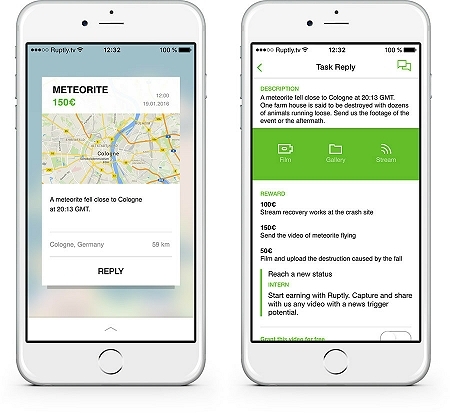 If the story is still happening, using a chat function inside the app, Ruptly can give assignments to the journalist, for additional rewards. These may be videos, or even a live broadcast, from a phone, with professional editors guiding the reporter about getting the best shot, or providing more details of the story. But Ruptly Stringer isn’t relying on someone always being there when a story breaks. As soon as the newsroom hears that something is happening, it will notify all those present in the same geographical area, and give them a set assignment to cover the story, with a financial reward. Ruptly is hoping that hundreds of thousands join its network, so that there will always be someone nearby, ready to do real journalism. Ruptly Stringer is custom-built on the foundation of Babo, a Russian-designed news-gathering platform. Babo has already been road-tested by Russian-language media, where 350,000 videos were submitted to a single news website. But now, the aim has been set even higher. “Ruptly Stringer is a revolution in citizen journalism,” says Babo founder, Ashot Gabrelyanov, who moved to New York to develop his app. Ruptly Stringer is already available for download for Android and Apple devices, and can be used by anyone over 18.